Big news this morning: three days before the stage race begins, we know who will be racing in Colorado. This race has started out exciting from the get-go as rider rosters were released just this morning. I am informed by Heather Krug, of the USA Pro Challenge that these very international lists of riders are preliminary and might change prior to Monday's start in Steamboats Springs. Taylor Phinney is back! I am so excited for him, and for us. Peter Stetina is back as well. 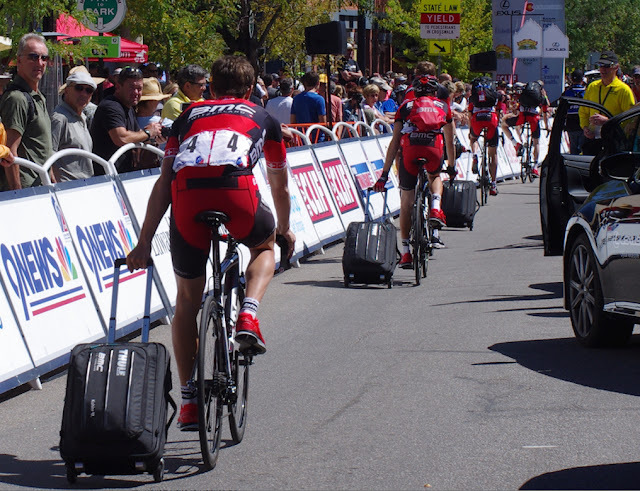 Both Stetina and Phinney raced last week at Tour of Utah. Michael Schär returns once again and is guaranteed to light up the race as he has done in past years along with his teammate Brent Bookwalter, another racer often seen on podiums in Colorado. There are some teams that both deserve, and will get, much attention at the race this year, they are: The Cycling Academy out of Israel; Team SmartStop, for their smart racing and animated team directors; BMC racing for their attempt to win a third year in a row; United Healthcare, a team name we will hear very often in the coming week; Axeon, with it's squad of pure talent and it's Team Director Axel Merckx and of course the talented crew at Hincapie Racing. Kiel Reijnen of the UnitedHealthcare Pro Cycling team. Local Colorado announcer Larry Grossman is on his way to Steamboat Springs this morning - more good news for spectators. You will enjoy Larry's smooth tone and informed commentary very much. He knows many of these racers very well and should add much to race events. I know I will be listening for his inside scoop. Should I buy a VIP tickets to the bike race?